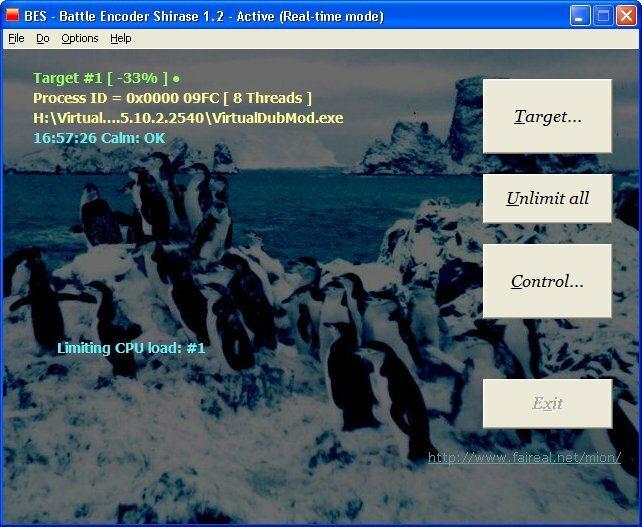 BES is a small tool that throttles the CPU usage for the process you “target”: for instance, you can limit the CPU usage of a process which would use CPU 100%, down to 50% (or any percentage you’d like). With this, you can use other programs comfortably while doing something CPU-intensive in the background. By limiting the CPU load, you can also cool down your CPU immediately when it happens to get too hot. It’s an “active” software CPU cooler. Conventional soft-coolers save CPU energy by making CPU sleep when it is idle. They passively wait until CPU gets idle. BES is more aggressive: it cools CPU by making the “heating” process slow down, i.e. periodically forcing CPU to be idle for a short time. (But you should install a better hardware cooler if you often need to use BES for this purpose. [FIX] Minor bug fixes and minor improvements.